This previous post briefly mentioned the DOJ’s recent Foreign Corrupt Practices Act enforcement action against Roberto Rincon and Abraham Shiera for alleged improper business practices with officials at Petroleos de Venezuela S.A. (PDVSA), Venezuela’s alleged state-owned and state-controlled oil company. This post goes in-depth regarding this recently unsealed criminal indictment. In the indictment, Rincon is described as a U.S. lawful permanent resident and a resident of Texas who controlled, together with others, a number of closely held companies, including several U.S. companies, that he used to secure contracts with PDVSA. Shiera is described as a Venezuelan national who resided in Florida who controlled, together with others, a number of closely held companies, including several U.S. companies, that he used to secure contracts with PDVSA. The “foreign officials” are described as follows. Official A – employed by PDVSA, including as a buyer at PDVSA and a supervisor of other PDVSA buyers. Official A’s job responsibilities including assigning bidding panels to PDVSA buyers, including Official C and Official D, who would then be responsible for selecting companies for the bidding panels, which allowed those companies to submit bids on individual PDVSA projects. Officials B – employed by PDVSA, including as a purchase analyst for PDVSA. Official B’s job responsibilities included selecting companies for bidding panels, which allowed those companies to submit bids on individual PDVSA projects. Official C – employed by PDVSA, including as a purchasing manager and superintendent of purchasing at PDVSA. Official C’s job responsibilities included selecting companies for bidding panels, which allowed those companies to submit bids on individual PDVSA projects, and selecting which companies would win the economic portion of the bid process. Official D – employed by PDVSA, including as a buyer for PDVSA. Official D’s job responsibilities included selecting companies for bidding panels, which allowed those companies to submit bids on individual PDVSA projects. Official E – employed by PDVSA, including as a purchasing manager. Official E’s job responsibilities included selecting companies for bidding panels, which allowed those companies to submit bids on individual PDVSA projects. The indictment refers to various PDVSA entities collectively as PDVSA including PDVSA Services Inc. (a U.S. based affiliate of PDVSA located in Houston, Texas that was, at various times, responsible for international purchasing on behalf of PDVSA) and Bariven S.A. (a PDVSA procurement subsidiary responsible for equipment purchases). assisting Rincon’s and Shiera’s companies in receiving payment for previously awarded PDVSA contracts, including by requesting payment priority for projects involving Rincon’s and Shiera’s companies. In addition to the conspiracy charge, the indictment also charges: (i) Rincon with four substantive violations of the FCPA’s anti-bribery provisions; (ii) Shiera with five substantive violations of the anti-bribery provisions; and (iii) Rincon and Shiera with money laundering conspiracy as well as seven substantive money laundering offenses. 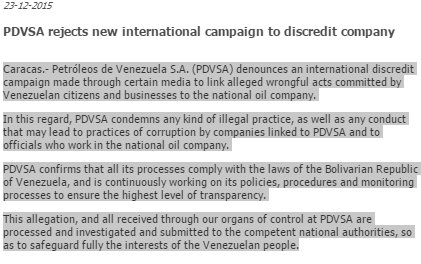 In response to the U.S. allegations, PDVSA released the below statement. First it was Johnson & Johnson (see here – $70 million enforcement action in April 2011). Then it was Smith & Nephew (see here – $22 million enforcement action in February 2012). Then it was Biomet (see here – $22.8 million enforcement action in March 2012). Then it was Pfizer / Wyeth (see here – $60 million enforcement action in August 2012). Then it was Eli Lilly (see here – $29 million enforcement action in December 2012). Then it was Stryker (see here – $13.2 million enforcement action in October 2013). Then it was Mead Johnson (see here – $12 million enforcement action in July 2015). The latest of the most recent Foreign Corrupt Practices Act enforcement actions (there are many more than those listed above) premised on the theory that physicians of certain foreign health care systems are “foreign officials” under the FCPA is Bristol-Myers Squibb Co. (“BMS”). Yesterday, the SEC announced this administrative cease and desist order in which BMS agreed, without admitting or denying the SEC’s findings, to pay approximately $14.7 million. The order states in summary fashion as follows. The findings focus on Bristol-Myers Squibb (China) Investment Co. Limited (“BMS China), a company through which BMS conducts business in China, and how BMS China, in turn, primarily operates in China through Sino-American Shanghai Squibb Pharmaceuticals Limited (“SASS”), a majority-owned joint venture. “BMS holds a 60% equity interest in SASS and has held operational control over this entity since 2009 when it obtained the right to name the President of SASS and a majority of the members of SASS’s Board of Directors. BMS began operating in China in 1982 when it formed SASS, the first SinoAmerican pharmaceutical joint venture. Following a successful product launch in 2005, BMS China’s business grew quickly. By 2009, BMS China had 1490 full-time employees and net sales of more than $200 million. This upward trend continued through 2014 when the number of full-time employees expanded to 2464 and net sales reached nearly $500 million. “BMS China failed to respond effectively to red flags indicating that sales personnel provided improper payments and other benefits in order to generate sales from HCPs. In 2009, BMS China initiated a review of travel and entertainment expenses submitted for reimbursement by its sales personnel and found non-compliant claims, fake and altered invoices and receipts, and consecutively numbered receipts. Shortly thereafter, BMS China retained a local accounting firm to conduct monthly post-payment reviews of all claims for travel, entertainment, and meeting expenses to identify false, improperly documented, and unsubstantiated claims. BMS China brought this function in-house in early 2011 and the results of both the external and internal reviews were provided to management of BMS China as well as regional compliance and corporate business managers who reported directly to senior management of BMS. During the period between mid-2009 and late 2013, BMS China identified numerous irregularities in travel and entertainment and event documentation, including fake and altered purchase orders, invoices, agendas, and attendance sheets for meetings with HCPs that likely had not occurred. BMS China inaccurately recorded the reimbursement of these false claims as legitimate business expenses in its books and records, which were then consolidated into the books and records of BMS. “Despite its longstanding presence in China, BMS did not implement a formal FCPA compliance program until April 2006 when it adopted its first standalone anti-bribery policy and corresponding corporative directive. At approximately the same time, BMS began conducting compliance assessments and audits of BMS China that included a review of internal controls relating to anti-bribery risks. These internal reviews revealed weaknesses in the monitoring of payments made to HCPs, the lack of formal processes around the selection and compensation of HCPs as speakers, deficiencies in obtaining and documenting the approval of donations, sponsorships, and consulting arrangements with HCPs, and the failure to conduct post-event verification of meetings and conferences sponsored by sales representatives. Reports of these findings were provided to senior management of BMS China as well as members of BMS’s global compliance department. These identified controls deficiencies were not timely remediated and compliance resources were minimal. The corporate compliance officer responsible for the Asia-Pacific region through 2012 was based in the U.S. and rarely traveled to China. There was no dedicated compliance officer for BMS China until 2008, and no permanent compliance position in China until 2010. In addition, the BMS sales force in China received limited training and much of it was inaccessible to a large number of sales representatives who worked in remote locations. For example, when BMS rolled out mandatory anti-bribery training in late 2009, 67% of employees in China failed to complete the training by the due date. “Emails and other BMS China documents detail, among other things, proposed “activity plans,” “action plans,” and plans for “investments” in HCPs to increase prescription sales. These contemporaneous documents were prepared at the direction of, and sometimes transmitted to, district and regional sales managers of BMS China, and show that sales representatives used funds derived from travel and expense claims to make cash payments to HCPs and to provide gifts, meals, entertainment, and travel to HCPs in order to induce them to prescribe products sold and marketed by BMS China. The sales representatives provided a variety of benefits to HCPs, ranging from small food and personal care items to shopping cards, jewelry, sightseeing, and cash payments, in exchange for prescription sales. This kind of conduct was captured in a July 2013 email from a sales representative to a regional manager. The sales representative explained that a former sales representative had offered cash for sales to HCPs at a local hospital and “the attitude of the director of the infectious diseases department was extremely clear when I took over: ‘No money, no prescription.’” Similarly, the work plans prepared by other sales representatives also identified correlations between the value of the benefits provided to specific HCPs and the volume of prescription sales expected. Yesterday Bristol-Myers’s stock closed down .47%. According to reports, Bristol-Myers was represented by F. Joseph Warin of Gibson Dunn. Not that Foreign Corrupt Practices Act are conveniently timed or anything like that, but the SEC’s fiscal year ends on September 30th and for the second consecutive day, the SEC announced an FCPA enforcement action (in the past two days the SEC has announced 22 other enforcement actions). Two days ago, it was Hitachi (see here for the prior post). Yesterday, it was Hyperdynamics Corp – an oil and gas company with shares quoted by the OTCQX, an over-the-counter marketplace operated by OTC Market Group, Inc. If there was ever an inconsequential FCPA enforcement this would be it. In fact, the SEC’s normally chatty press office didn’t even issue a release. However, as relevant to the title of this post, tell Hyperdynamics shareholders that this episode was inconsequential and they are likely to have a different opinion. “Hyperdynamics was founded in 1996 as a commercial computer and communications service provider. In 2001, the company transitioned to the oil and gas industry, and one year later, Hyperdynamics purchased contract rights from a small oil company which owned the exclusive drilling rights offshore the Republic of Guinea. Company executives began travelling to Guinea in 2005, and eventually opened a wholly-owned subsidiary in Conakry to facilitate ongoing operations. From July 2007 through October 2008, Hyperdynamics, through its subsidiary, paid $130,000 for public relations and lobbying services in the Republic of Guinea to two supposedly unrelated entities – $55,000 to BerMia Service SRL, and $75,000 to Africa Business Service (“ABS”). The subsidiary’s books and records were consolidated with Hyperdynamics’s books and records, and these payments were recorded as public relations and lobbying expenses, even though the company lacked sufficient supporting documentation to determine whether the services were actually provided and to identify the ultimate recipient of the funds. In late 2008, Hyperdynamics discovered that a Guinean-based employee controlled BerMia and ABS. Hyperdynamics also learned that this employee was the sole signatory on the ABS account. But Hyperdynamics could not determine how, if at all, BerMia or ABS spent the funds they had received, or whether any services actually were provided. Moreover, the company could not recover the funds. There is no evidence that these funds were in fact spent on legitimate public relations and lobbying activities, yet Hyperdynamics’s books and records continued to reflect that the funds were spent for these purposes. Based on the above, the SEC found that Hyperdynamics violated the FCPA’s books and records and internal controls provisions. “Beginning in July 2009, Hyperdynamics replaced its senior management team and its entire Board of Directors. The company also hired its first in-house lawyer, who implemented a number of training programs and revised company policies related to its Guinean operations. Hyperdynamics also increased the number of its accounting personnel, and instituted a series of procedures to more strictly control and identify transfers of funds to Guinea, including the transfer of signature authority over Guinean accounts to Houston-based employees, as well as requiring corporate pre-approval for all Guinean expenditures. Without admitting or denying the SEC’s findings, Hyperdynamics agreed to pay a $75,000 penalty. “As previously disclosed, the SEC had issued a subpoena to Hyperdynamics concerning possible violations of the FCPA. This settlement fully resolves the SEC’s investigation. As previously disclosed in May 2015, the DOJ closed its investigation into possible FCPA violations by Hyperdynamics without bringing any charges against the Company. The allegations in the Order relate to certain issues concerning the company’s books and records and internal controls in 2007-2008. Hyperdynamics consented to the SEC Order without admitting or denying the SEC’s findings and agreed to pay a $75,000 penalty to the SEC. Calculating the ratio between pre-enforcement action professional fees and expenses and settlement amounts, this represents a whopping 170 to 1 ratio. (To learn more about such ratios see “FCPA Ripples“). If I were a Hyperdynamics shareholder, I would be asking some serious questions. Nancy Kestenbaum, Lanny Breuer and Barbara Hoffman of Covington & Burling reportedly represented Hyperdynamics. What happens when a Japanese company has a German-based subsidiary, which in turn has a South African subsidiary, that both allegedly make improper payments to a South African political party? Why of course, $19 million to the U.S. treasury because the Japanese company just happened to have American Depositary Shares traded in the U.S.
“In 2005, Hitachi created a subsidiary in South Africa for the purpose of establishing a local presence in that country to pursue lucrative public and private contracts, including government contracts to build two new major power stations. Hitachi sold 25% of the stock in the newly created subsidiary to Chancellor House Holdings (Pty) Ltd. (“Chancellor”), a local South African company that was a front for the African National Congress (“ANC”), South Africa’s ruling political party. Hitachi’s arrangement gave Chancellor- and by proxy the ANC- the ability to share in the profits from any power station contracts secured by Hitachi. Hitachi also entered into an undisclosed “success fee” arrangement with Chancellor, wherein Chancellor would be entitled to “success fees” in the event that the contract awards were “substantially as a result” of Chancellor’s efforts. During the bidding process, Hitachi was aware that Chancellor was a funding vehicle for the ANC. Hitachi nevertheless continued to partner with Chancellor and encourage Chancellor’s use of its political influence to help obtain the government contracts. As a result, Hitachi was awarded power station contracts in South Africa worth approximately $5.6 billion. In April and July 2008, Hitachi paid the ANC- through Chancellor- “success fees” totaling approximately $1 million. Hitachi’s South African subsidiary inaccurately recorded its “success fee” payments to Chancellor as “consulting fees” in its books and records for the year ended December 31, 2008. The inaccurate books and records of Hitachi’s subsidiary were consolidated into Hitachi’s financial statements for the fiscal year ended March 31, 2009, which were filed with the Commission. Based on the above allegations, the SEC charged Hitachi with violating the FCPA’s books and records and internal controls provisions. Hitachi Power Africa (Pty) Ltd. (“HPA”), during the relevant time period, a majority-owned subsidiary of HPE based in South Africa, that executed power station orders in South Africa. Eskom is described as follows. “While its political com1ections were extensive, Chancellor lacked any engineering or operational capabilities that could assist Hitachi with contract perfotmance should it secure the Eskom contracts. Chancellor differed in this respect from at least one other local South African entity that Hitachi initially considered for partnership with HPA. “During the time it was registered with the Commission, Hitachi failed to devise and maintain an adequate system of internal accounting controls. HPE and HPA were able to enter into a shareholders’ agreement and an undisclosed “success fee” arrangement with Chancellor- a front for the ANC- to pay that entity for exerting its political influence. Although HPE had a code of conduct in place before the success fees were paid that specifically prohibited contributions to political parties, HPA paid Chancellor more than $1.1 million pursuant to this side-arrangement. HPA was able to do so despite a stream of reporting in the South African media that publicized the fact that HPA’s 25% shareholder was a funding vehicle for the ANC. HPA also was able to record Chancellor’s invoices for success fee payments as “consulting” expenses, which they were not, without proper documentation or reasonable detail. Hitachi’s intemal accounting controls failed again when Hitachi declared and recorded as dividends to be paid to Chancellor transactions that, in fact, would instead be payments to a foreign political party for its assistance in securing govemment contracts. Among other further intemal accounting controls deficiencies, Hitachi failed to conduct adequate due diligence of Chancellor, a potential agent and a potential shareholder of HPA, and to keep records of such due diligence, even though Hitachi intended for Chancellor to use its political influence to help obtain government contracts. As noted in the SEC’s release, without admitting or denying the SEC’s allegations, Hitachi agreed to settlement that requires it to pay a $19 million penalty and to be enjoined from future FCPA books and records and internal controls violations. Hitachi was represented by Linda Chatman Thomsen (a former SEC Director of Enforcement, currently at Davis Polk & Wardwell).